I am afraid to tell you how happy I got when I saw my October 2014 Stick in a Box show up at my door. Really happy! I wasn't expecting it either! I still was basking in the beef jerky flavor party that my taste buds had last month. 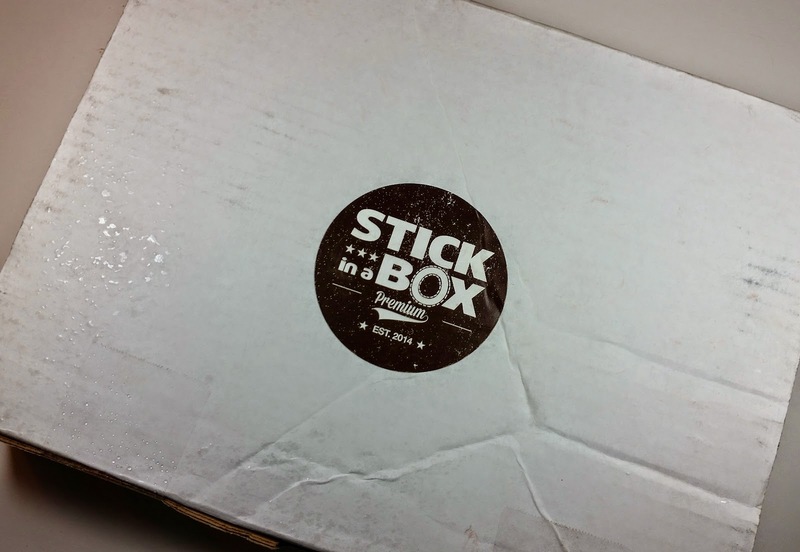 Stick in a Box sends beef jerky packages right to your door. They find small batch, fun and interesting jerkys, along with some big name brands tested for beefy goodness. It's possible you may recognize some of these brands but so far I haven't known about any of them. That September box set the bar preeeetty high! So we have to see if this box measures up. I was determined to share more generously with my husband this time but he wasn't here when I opened the box. He might be a little disappointed but since he didn't get to taste one of the beef jerkys, he doesn't know what he's missing. 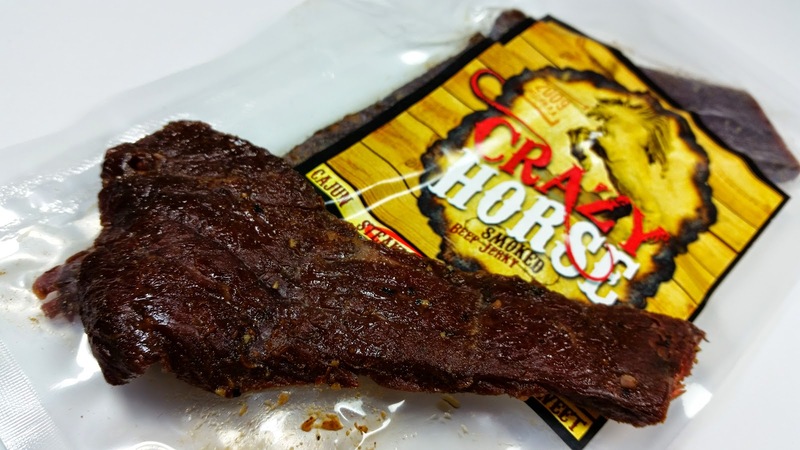 Crazy Horse Smoked Beef Jerky in Steakhouse- This is the first Crazy Horse beef jerky I've ever had and it is out of this world! Talk about juicy and succulent! Fabulous! The steakhouse flavor was subtle and delicious. Big, thick pieces, too. This was my favorite one of this bunch. It's also the one my husband didn't get to taste. I wonder how I can find more of this. I think an internet search is in order. They have three other flavors and I'd like to try their Original. This is a family run company from Pennsylvania and all their meats are smoked with an old family recipe. 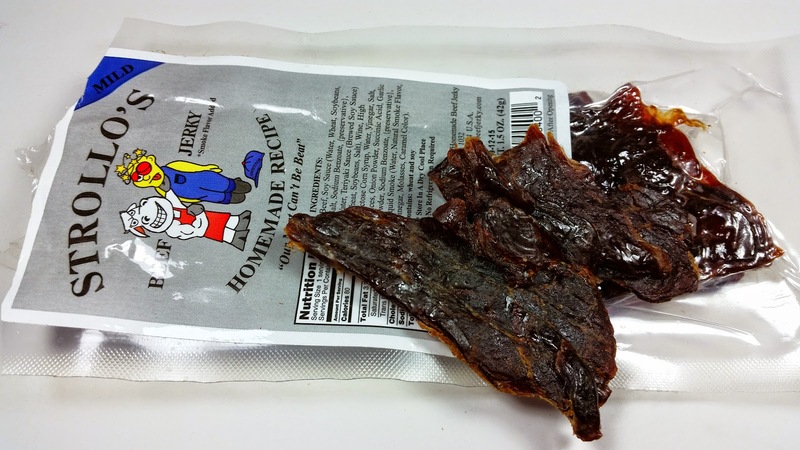 Strollo's Beef Jerky Homemade Recipe- This jerky is much drier than the Crazy Horse and has a flavor that at first I didn't like. Then it started to grow on me and I realized it is delicious. I was sad to see that it was only a 1.5oz bag but looking on their site, I see that's just they size they come in. Strollo's beef jerky is made in small batches to ensure the highest level of freshness and quality in each bag. 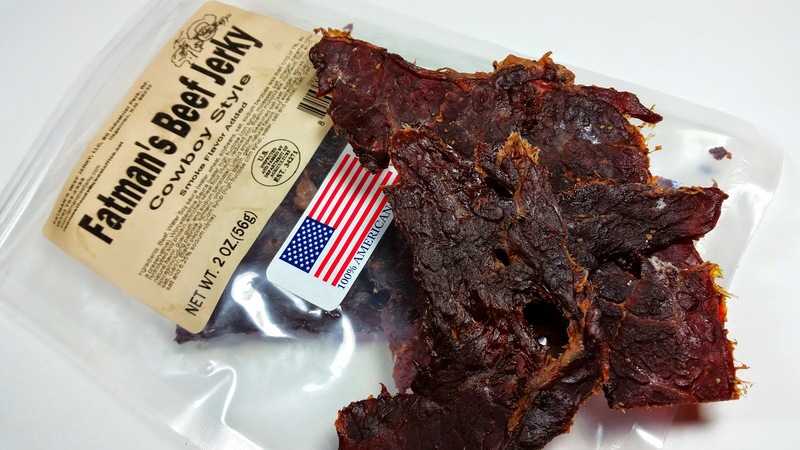 Fatman's Beef Jerky Cowboy Style- This is also a thinner, drier cut. The flavor is excellent and probably a more typical beef jerky flavor than the last two. Fatman's was started by a cattle rancher and he only uses American beef to make his jerky. This is my second favorite of the bunch. Fatman's Peppered Beef Snack Stick- I admit I have a little more trepidation when it comes to the beef sticks. Jerky I love, snack sticks are more iffy. I tried this one and... well, I didn't care for it. At all. The ingredients are fine, its real beef, etc. But something with the spice used to make this did not work for me. Timber Ridge Sunrise Snack Stick- These are crazy sticks! I was expecting regular sticks but this one has maple syrup, sage and celery juice in it! It doesn't taste like beef, it tastes like... Thanksgiving stuffing! Seriously. No joke, that's exactly what it tastes like! Too weird for me but definitely interesting. Timber Ridge Ranch Snack Stick- After the last two threw me for loops, I was REALLY worried about trying a beef stick flavored like ranch. But I like ranch so I girded my loins, opened the stick and took a bite. Much better! I thought I was going to hate it with weird ingredients like powdered milk, garlic and bell peppers but it's the tastiest of the bunch (according to me and my tastebuds). VERDICT: I paid $15 for this box using the coupon code BFF (you can use it, too, if it still works!) and received $24 worth of beef jerky. That's a deal for me! However the regular subscription price is $35 so I would like to see at least one more bag of jerky added to this box. Partly because I love the bagged beef jerky the most and hey, the more the merrier! But also because a subscriber needs to see the value in what they are receiving. There is an inherent value in having a box of awesomeness curated and provided to you but if the monetary value isn't also there something needs to change. I hope that the craft jerky companies start jumping on the Stick in a Box bandwagon because guess what I'm going to go get today? Yep. Crazy Horse beef jerky. It's that good and I wouldn't have ever known about it otherwise if it weren't for Stick in a Box. So a beef jerky fanatic would love this box. It provides a new an interesting way to acquire delicious, little known meats to satisfy every beef jerky fantasy. 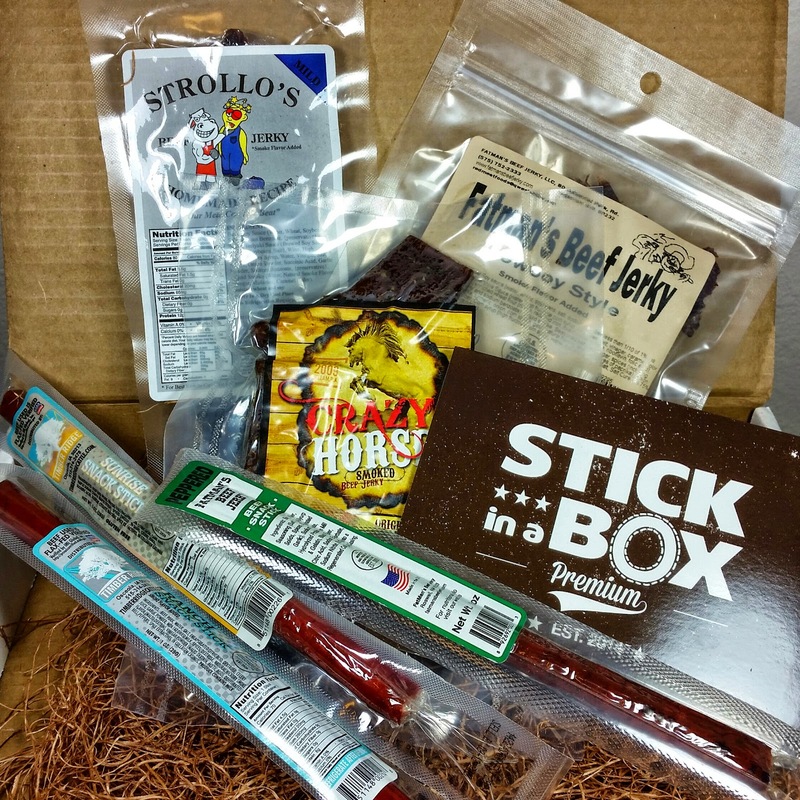 If you want to try some beef jerky, sign up at Stick in a Box and use code BFF to get your first box for $15! That is totally worth it! Who wouldn't love a box of beef jerky dropped on their doorstep? !